Read the Miami Herald report. See video of the judge giving the ruling and a video report from a local CBS affiliate. Dedicated to drawing attention to the major donors of the Yes on 8 campaign, they're a great source of information. If you hear rumors about who donated and who didn't, you can go here to verify. Note: this is a relaunch of the site. And by the way, check out their campaign section near the top. Recently, there was a town hall held in the Los Angeles, African American community discussing Prop 8. Unfortunately, I was unable to attend, but Derrick, of the blog Uncle Fat Lips, was kind enough to allow me to post his account of this very interesting meeting. "There was a panel of black ministers early on that I caught almost at the tail end. And of course with their self-righteous stupid asses they quoted the bible and all that madness. But I'm so glad that they were among the first panels to go up. And that's because the gays and lesbians were able to follow them up and give these men a dose of reality in terms the REAL aftermath of Prop 8 and what these fools created by encouraging blacks to vote Yes. "So a lot of revealing information for the ignorant was brought to the table in so much as the big funders for YES on 8 were the one and same big funders who backed McCain's campaign and all that. Bottom line: many blacks just simply were not aware that by supporting Prop 8 they were going to bed with the enemy. And in truth, that's the most awful part about it all---the ignorance surrounding the ramifications in supporting Prop 8--as was discussed at great length today. More...". . . But what it all melted down to was that many blacks generally made the grave mistake of voting through the prism of religion. That was the hottest topic---2nd to the fact that it is time that black homophobia be addressed on a community level since clearly it's an issue. "I'd say there was some breakthrough simply for the fact that the ministers who attended (all of which head black mega churches) got a chance to see and hear what's going on in the real world; to hear the resentment and pain of those black gays and lesbians in long term relationships who have been denied their civil rights. And particularly it was good for these ministers to hear from black gays and lesbians who are still involved in church. "I think the most powerful presence and the one that made the ministers feel the most ill at ease was the presence of the Southern Christian Leadership LA Chapter president. And that's simply because the SCL came out vocally against Prop 8. How can you justify your religious stance to the organization founded by Martin Luther King? "So the SCL is one sore spot they can't get around. And think that's why the ministers showed up and for the most part---with the exception of the bible thumping---they seemed somewhat receptive and seemed to actually be engrossed in what others had to say. More than likely that's cause it's the first time any of them heard any of it from a different perspective than their own. "Everyone against Prop 8 unanimously agreed however that the No on Prop Campaign was pathetic in comparison to the well thought out strategies of Yes on Prop 8--particularly when it come to aggressively recruiting black votes--which No on 8 didn't bother to do. And they also wholeheartedly agreed that this still didn't excuse the black voter turnout on Prop 8 or diminish the issue of homophobia in the community. ". . . The facts now reveal that overall (whether you agree or disagree with gay marriage) it was not in our [African Americans] best interest as a community to support that measure. And because we did there may be prices to be paid as a result. "That information, I think, was probably the most sobering of the townhall meeting. And it was clear, based on the quiet demeanor of those black ministers who encouraged the support of Prop 8, that they themselves were not at all clear on the possible negative legislative impact it could have on California blacks in the future. In terms of discrimination---if you open Pandora's Box---you open Pandora's box for all and everything. They simply had no business endorsing the measure. I think they walked away from the event now in realization of this." Lorri L. Jean, CEO of the LA Gay & Lesbian Center and Exec Committee Member of the No on 8 Campaign, has posted an FAQ about the failed campaign here. "Steve and Celinda and their teams conducted numerous polls and focus groups to ascertain which messages were most effective with undecided voters. The polling consistently showed that about 40% of the voters were firmly in favor of Prop 8 and 40% were firmly against it. That left 20% that were either leaning or undecided. That was the population to whom the advertisements were targeted. "The polling and focus groups showed a number of things. For example, use of the words “hate” or “discrimination” was not effective with undecided voters; in fact, it made them less inclined to support the No on 8 position. Use of the terminology “treating people differently under the law” was found to be much more effective and made undecided voters more inclined to support the No on 8 position. Our experts advised that the most effective way to win over undecided voters was to heed the lessons of the polling and focus groups. These were different messages than would have been used if we were trying to shore up our base rather than attempting to persuade undecided voters." On the other side of the equation is Terry Leftgoff, who formerly served as the highest ranking openly gay officer of the California Democratic Party and oversaw numerous campaign efforts, and calls the No on 8 campaign "bungled" and "ineffective." You can see his guest post here. More..."The sanitized media messages smacked of a campaign by focus group. Such an outdated orthodox approach should have been over-ridden by common sense and political savvy. "Instead of running a diverse multi-message campaign of persuasion, the media message was emotionless, monotone and uncompelling. In short, the media messages failed to move or even educate voters about the issue and instead appealed to a single abstract principle - equality - that was not sufficiently persuasive or connected to the content of the proposition. Worse, there appeared to be no effective Black or Latino strategy." In my honest opinion, I agree with Terry. The No on 8 campaign smacked of self-homophobia, ashamed to show our diverse face to the world that has clearly indicated, when presented with the personable face of the gay community, is receptive to us and our call for equal rights. The campaign kept us in the closet, fearful of the world that is already changing. The sad irony - it was the leadership of the campaign that was stuck in the past, unaware and out of touch of the changing world around them. Andrew Callahan has written on the Daily Kos about Mormons resigning from the LDS church in response to its overwhelming support for Prop 8, posting some of the letters written to the church from its ex-members. More..."Mormons supported slavery AND Jim Crow and discrimination outright against blacks in their religion. And if blacks reject THEM to this day....would they be so surprised and dismayed? They treat gay people THE SAME WAY...if not worse.... So what changed Mormons on blacks, that can't also change on gay people?" To be more specific, the Fundamentalist Church of Jesus Christ of Latter Day Saints has a more pronounced history of racism. See Wikipedia. But even the Book of Mormon for all Mormon denominations speaks of the curse of black people. See here. If the majority of Mormons have changed their view on African Americans, is it possible in time for their views to change on gays? Not that I expect a big change within the Mormon church anytime soon, but change comes with small, first steps - hopefully we can take encouragement, even from these few resignations. According to a reader of Joe.My.God. 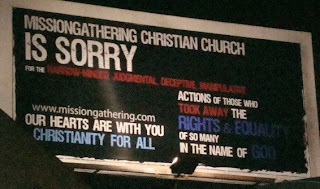 's blog, the Missiongathering Church in San Diego has paid for a billboard, apologizing for Prop 8. · Steve Smith, No on 8 senior campaign consultant of Dewey Square. WHEN: Tuesday, Nov. 25, 2008, 6 – 7:30 p.m.
WHERE: Visit www.lagaycenter.org/Prop8TownHall for details. INFO: Questions for the panel can be e-mailed in advance of the event to the moderator at TownHallModerator@gmail.com and can also be submitted live during the event.